It's been frosty around here the last couple days. When she saw the trees yesterday morning, my daughter said, "Mommy, look at the white trees. They are so pretty." I agree. i like your pics very much. Those are just beautiful!!! It made me feel like taking a deep breath of fresh air! Wow! 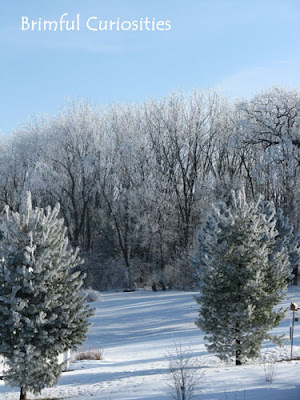 What beautiful photos - you captured the snow and frost wonderfully! Wow, those are gorgeous! Just beautiful! Nice job! Wow, beautiful! Plenty of rain where I am now. 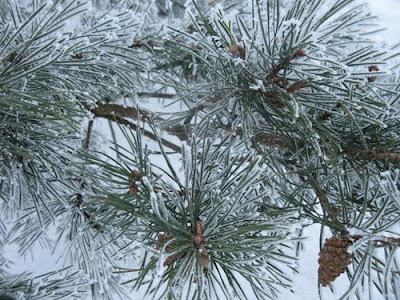 Love the snow and pine cone too. Funny, I just blogged about my love of the pine cone motif at Asilomar. So fun to see another pinecone here. Those are simply stunning pictures!! I agree they are so pretty when the trees are all frosted like that. We had some beautiful mornings too last week. I wish I'd taken some pics! Your pictures are gorgeous!